SKU: 3111. Categories: Arches & Arbors, Wedding Accessories. 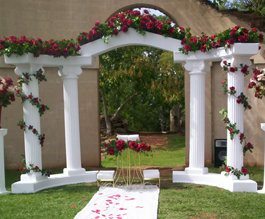 Decorative roman style columns used for wedding props or themed events. Can rent components separately. Can be angled at different degrees to accodomate any venue size.